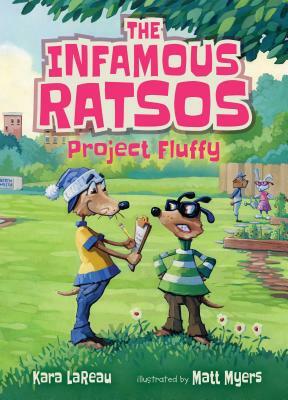 Louie Ratso tries to help super-cool Chuck Wood win the heart of his friend Fluffy Rabbitski in the third installment of the Infamous Ratsos. Chuck Wood is the most popular kid in school, and Louie Ratso can’t believe that Chuck has asked him for help! Chuck likes Louie’s friend Fluffy Rabbitski, and he wants Louie to help him get Fluffy to notice him. As for Ralphie Ratso, he can’t believe that his brother wants to spend all his time with Chuck instead of with him. Meanwhile, despite Louie and Chuck’s attempts to get Fluffy's attention, she has eyes for only one thing: her garden. But there may be hope. As their father, Big Lou, tells his boys, the best way to get someone to like you is to show that you’re interested in what they like. After all, that’s how Big Lou won over Mama Ratso years ago. Can Louie help Chuck find a way into Fluffy’s heart? And will Ralphie find a way to let his brother know how much he misses him? Kara LaReau is the author of numerous picture books, as well as the middle-grade series The Unintentional Adventures of the Bland Sisters. She lives in Providence, Rhode Island. Matt Myers is the illustrator of E-I-E-I-O: How Old MacDonald Got His Farm with a Little Help from a Hen by Judy Sierra, and Pirate’s Perfect Pet by Beth Ferry, as well as many other books for young readers. Matt Myers lives in Charlotte, North Carolina. Large type, lots of comedic black-and-white illustrations, and reading-level-appropriate text suit the book to newly independent readers. The Ratso brothers' third outing is good, anthropomorphic fun. As with the previous entries, the characters act as stand-ins for young readers navigating real-world situations, this time concentrating on friendship, loyalty, and responsibility, threads that are woven subtly throughout the chapters. Best of all, LaReau trusts readers to draw their own conclusions about the characters and their feelings...Here readers find big ideas expressed in simple words and actions, creating a fine addition to a solid series. A pleaser for fledgling chapter-book readers, rather more heavily and explicitly agenda-driven than previous episodes, but chock full of positive values and life lessons.